Radioisotopes are isotopes of a radioactive substance. b. the non-stable isotopes (radioactive). 2. Unstable isotopes go through radioactive decay and emit radiation and they are known as radioisotopes. 3. 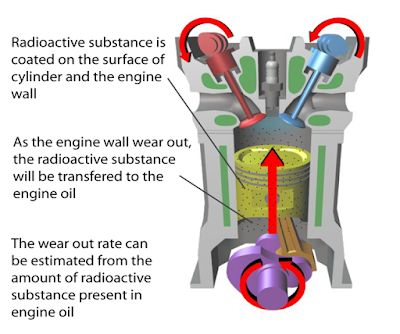 Radioisotopes have many applications in industry. Gamma rays of cobalt-60 can be used to destroy cancer cells in patients. This treatment is known as radiotherapy. 1. A small amount of sodium-24 is injected into the patient's body. 2. Radioactive imaging is then used to detect accumulation of sodium-24 and therefore detect tumours and blood clots before they become dangerous. 1. Gamma ray emitted from radioactive cobalt-60 can kill germs such as bacteria and fungus. 2. Medical instruments such as surgical equipment, syringes and bandages can be sterilised by using gamma rays. 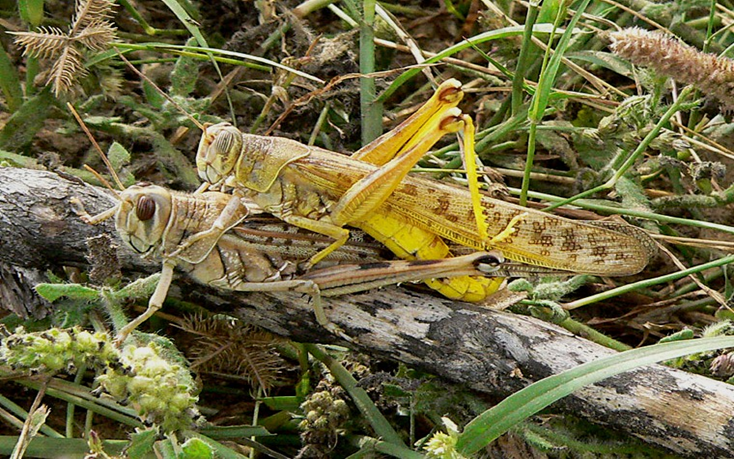 Male insect is sterilised by exposing to radioactive radiation and then released back to the ecosystem. This can ensure that their reproducing effort do not generate new generation and hence reduces the population of the insect. 1. The metabolism of phosphorus by plants can be studied using phosphate fertilisers that contain phosphorus-32. 2. A small amount of phosphorus-32 is used in fertilisers. 3. 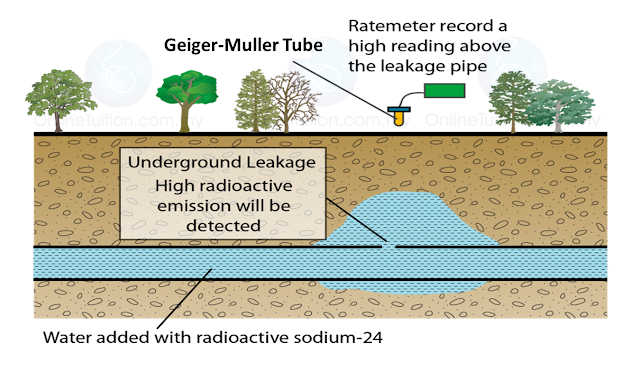 The radiation produced by phosphorus-32 decay is detected by a Geiger-Muller counter. This method can trace the passage of phosphate ions in plants. 4. Carbon-14 is used to study the passage of carbon during photosynthesis in plants. 1. 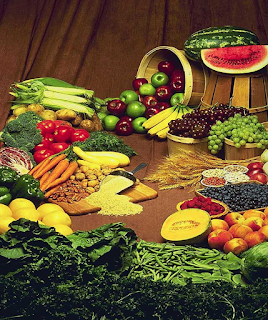 Radioactive radiation is targeted to the seeds of plants and hence causes mutation to the genes. 2. By chance, this may develop some superior agricultural products. 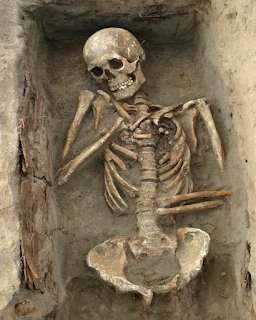 Radioisotope carbon-14 is used to study and estimate the age of ancient artifacts. This method is named as the radiocarbon dating. 1. The gamma rays from cobalt-60 are used to kill bacteria in food to make fresh vegetables and fruits last longer without any change in quality, flavour and texture of food. 2. Gamma rays are used to inhibit budding in potatoes and germinating in onions. 1. 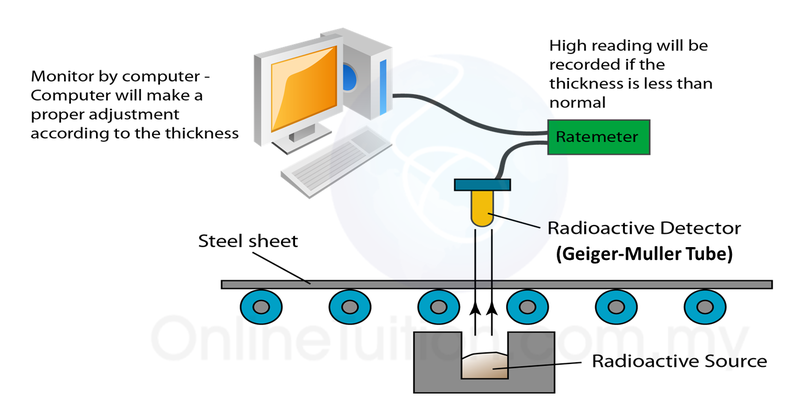 In a factory, the thickness of paper can be controlled by measuring the quantity of radiation penetrating the paper with the Geiger-Muller counter. 2. Apart from paper, the thickness of plastic, aluminium or iron can also be controlled by using beta rays. 1. 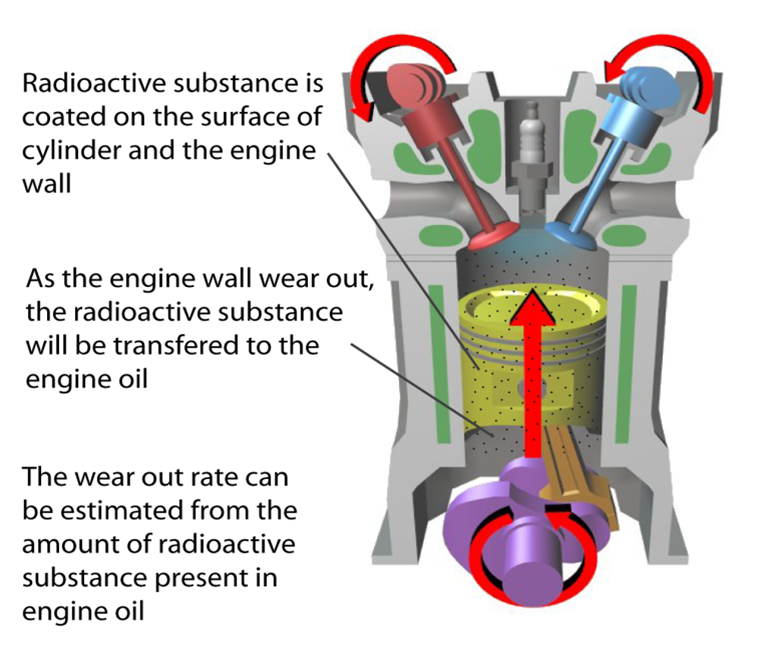 A small quantity of radioactive substance is put into water, gas or oil in an underground pipe. 2. The movement of the radioactive substance can be traced by using the Geiger-Muller counter. 1. 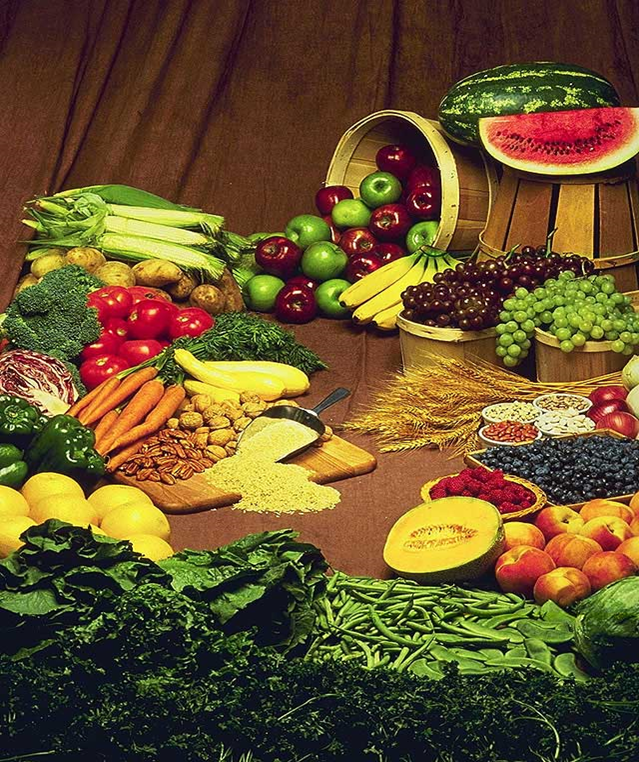 Radiation is used for checking whether a food container has the right amount of food stuff.